Sonic Vigil is a festival of improvised music, sound art, and video that takes place every year in the wonderful city of Cork. For Sonic Vigil 8, the festival is extending its reach into 3 days of activities, from 2-4 May 2014. The main event is Saturday from 2 to 8pm in St. Anne's Church, Shandon. It's easy to find, since the steeple is the famous tower with a clock on each face, visible from all over the city. The format is amazing... musicians will be selected at random with a Max patch, and will then create an ad hoc performance with whoever else pops up on the computer screen. 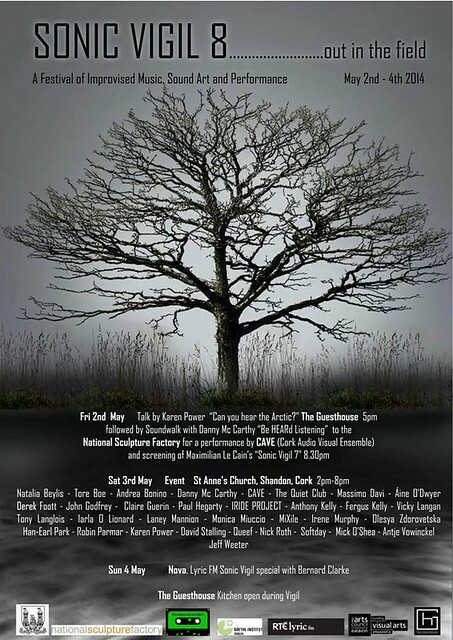 Among the many performers are some good friends and collaborators: Áine O'Dwyer, Paul Hegarty, Fergus Kelly, Danny Mc Carthy, Mick O'Shea, Vicky Langan, Karen Power, Anthony Kelly, David Stalling, Irene Murphy, Tony Langlois, John Godfrey, and Softday. Plus a host of people I will be happy to meet for the first time. When you get hungry the Guesthouse up the road will be open for some of their famous cuisine. The event is free, though the food might carry a small donation. I am most interested in playing with Paul Hegarty so we can test a few ears, Áine O'Dwyer so we can snap a few strings, and Vicky Langan so we can break a few hearts. Literally! Based on the first seven iterations, this is the sonic event of the year. Miss it at your peril. Reaktor reaches end of life?